Interior Secretary Ryan Zinke Reacts To Multiple Ethics Allegations By Calling Democratic House Rep A "Drunk" - Joe.My.God. Interior Secretary Ryan Zinke on Friday accused the House Natural Resources Committee’s top Democrat of “drunken” behavior and paying “hush money” after the Democrat called for the secretary to resign for his series of ethics scandals. “It’s hard for him to think straight from the bottom of the bottle,” Zinke wrote on his official Interior Department Twitter account after Rep. Raúl Grijalva (D-Ariz.) published an op-ed asking for Zinke’s resignation. 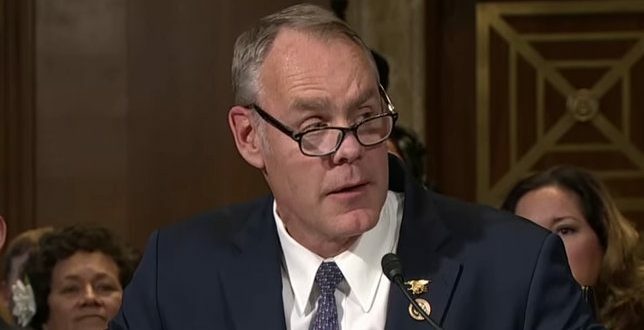 The remark, which in most eras would be considered a stunning breach of decorum for a sitting Cabinet member, is the latest in a string of comments by Zinke proclaiming his innocence or calling for investigations against his critics. Incredibly smart to insult the guy who’s going to have subpoena power over you in a month. Well done. hey ryan, trying to remember—did you ever explain how whitefish energy, a two person company from your hometown, got a multimillion dollar contract and royally fucked puerto rico? there are a lot of people who are still super curious about that!! let us know, thanks! NOTED: @SecretaryZinke‘s LLC at the heart of the Halliburton brewpub investigation was originally called Continental Divide Inns. So we will certainly #TuneInnForMore.